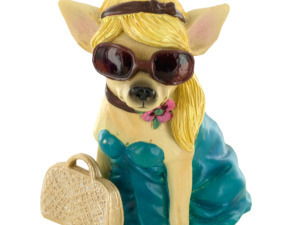 Perfect for dog lovers, this fun Aye Chihuahua Fashion Figurine features a detailed resin figurine of a girl Chihuahua in a fancy teal dress with stylish sunglasses, a headband, flower choker, purple heels and a gold handbag. Measures approximately 3.75" tall x 3.25" wide. Comes packaged in an individual box. 6 pcs. 12 pcs. 18 pcs. — 24 pcs.